Angle between vectors - how to calculate and code it! This article describes how to calculate the angle between vectors, the angle between each vector and axis, and the magnitude of each vector. 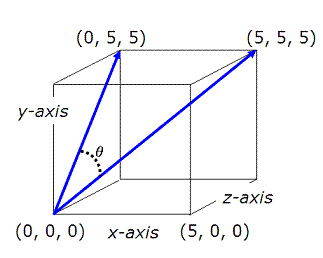 The vectors are given in three-dimensional space. The code and examples were developed in Matlab code. able to call those scripts whenever we need them and avoid retyping instructions for every couple of vectors that we use. Built-in function ‘num2str’ converts numbers to strings, in order to concatenate them to other strings and improve the formatting previously to display the results on screen. Find the angle between a diagonal of a cube and a diagonal of one of its faces. The cube measures 5x5x5 units. Find out the angle between vectors (1, 0, 0) and (1, 1, 0). It’s nice to have this case as an example, because we can figure it out from the beginning, right?